Office workers deal with a dispute in this amusing and enlightening animated short. "Since it is a cartoon with no dialogue, it can be used in any language setting, and...in most cultures." Paul Wahrhaftig, president, Conflict Resolution Center International, Inc. The fourth film in the National Film Board of Canada's ShowPeace collection on conflict resolution, ELBOW ROOM is a witty look at the different ways in which we deal with conflict, and their consequences. In this animated short, we watch as a simple dispute between a pair of office workers is played out four different ways, each of them reflecting a common real-life approach to conflict: retreat, denial, aggression and negotiation. 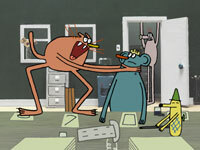 Dinner for Two - Funny animation teaches lesson on conflict resolution. When the Dust Settles - Gophers provide lesson about conflict resolution. Bully Dance - Insight on dealing with bullies. T�te � T�te � T�te - A playful animated film that provides a thought-provoking commentary on how beings interact. Dominoes - Lively cut-out animation illustrates the tensions when a newcomer enters a pre-established group. "Are you looking for a short training video that will provoke good discussion about workplace conflicts and ways of approaching it? The National Film Board has produced a fine 8-minute cartoon sequence that does it all. Since it is a cartoon with no dialogue, it can be used in any language setting, and the workplace task and conflict are so abstracted that it can be used easily in most cultures. ... I tested it by running it for a new trainee. It quickly provoked a discussion covering the nature of conflict, various conflict styles, and impact of conflict on the workplace. The tape would be a welcome addition to most trainers' packs, and it is affordable, too." Paul Wahfhaftig, President, Conflict Resolution Center International, Inc.
A study guide in PDF format is included on the DVD-ROM portion of the disc. Funny animation re-works the Frankenstein legend to show how to overcome shyness. A warm and loving film about a household facing and overcoming a crisis.